The annual meeting of the American Psychiatric Association was held in New Orleans this past week. The weather was hot (in the mid-90s) though the meeting was somewhat tepid and under-attended. The exhibition hall in particular had an empty and echoey feel that I had not seen in years past. I talked to one exhibitor, my friend Dr. David Robinson, the prolific author of several books and the owner of Rapid Cycler Press, who told me that ever since the drug companies had stopped giving out free gifts, the attendance at exhibit halls was down. “In the past, they used to line up before the hall opened in the morning. No more.” This is not terribly good news for the publishers, but on the other hand publishing is undergoing unrelated and much more far-reaching changes with the advent of e-books, and the ritual of carting tons of paper to exhibit halls will eventually end. Another attendee, a noted researcher in mood disorders, told me that he noticed fewer psychiatrists from other countries this year. Most such psychiatrists typically receive travel funding from drug companies. But this year, because of the APA's decision last March to phase out industry-funded symposia, fewer companies were willing to pay the travel expenses of our foreign colleagues. What's the connection, you might ask? In the past, companies justified these travel expenses because they knew that the sponsored psychiatrists would be attending their CME symposia, which are infomercials in support of their latest drugs. There were only two such symposia this year. So the ROI (return on investment) of funding foreign attendees is no longer robust enough to justify the marketing expense. Nonetheless, there were still plenty of exhibitors, including mega displays by Merck to push their antipsychotic Saphris (ALL the effectiveness, plus a numb mouth and a metallic taste! ), Shire for Vyvanse (proud sponsors of drug diversion for college students since the 1990s), Lilly for Cymbalta (depression is painful, depression is painful, depression is....), and several others. And they were still giving away things, but not the disposable cameras, personalized business cards, or emblazoned clocks of old. Now, the only things they can offer are "educational" items such as textbooks, and here Stephen Stahl was the superstar, doing book signings for various drug companies (you can see one of the announcements here) who have found that his faith in molecular psychopharmacology dovetails nicely with their marketing messages. The man's a great writer, I'll give him that, and he works the pharma angle with the energy and creativity of a Barnum and Bailey circus hawker. He's obviously making some serious cash from industry, but frankly, I'm a little embarrassed for him. However, I'm the one who should really be embarrassed. Sauntering through the APA's official book publishing area, I came across Dr. Mina Dulcan, Chair of Child Psychiatry at Northwestern Medical School. 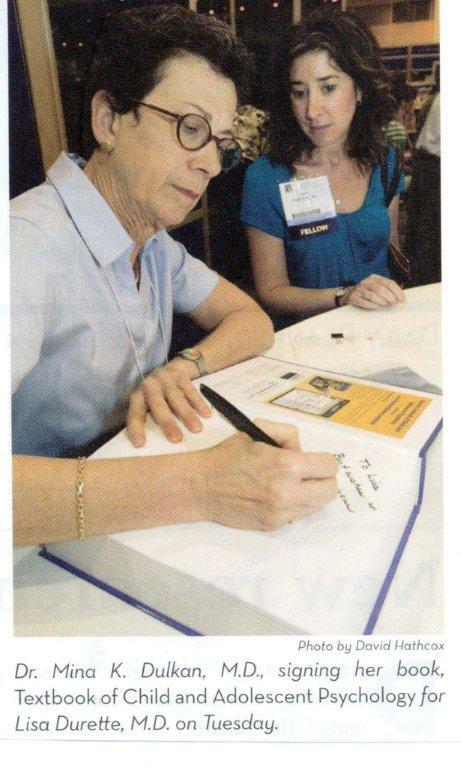 She was signing copies of her various textbooks. She's a bigwig in the field, having been the editor in chief of the major journal in child psychiatry (the Journal of the American Acacemy of Child and Adolescent Psychiatry) until recently. (The photo above was apparently taken after the events outlined below. It was published in the APA's daily meeting bulletin--and yes, they spelled her name wrong). Anyway, I went up to her to introduce myself in order to show her a copy of my new newsletter, The Carlat Child Psychiatry Report, edited by Dr. Caroline Fisher from UMass Worcester. "Hi Dr. Dulcan," I said, "I'm Danny Carlat, nice to meet you." She took a look at my name tag, and said, "Oh, I've heard about you." Since her expression was somewhere between stern and outright hostile, I queried, "In a good way or a bad way?" "How DARE you write an article in the New York Times saying that your therapy training at Mass General was terrible, and then later having this GREAT AWAKENING that"--she made a religious hand waving gesture--"'Oh, it's important to understand my patients,' and then you write an article in order to sell your new book and your newsletter. How are you any different from the drug companies? I was outraged by your article and showed it to my colleagues. What a disservice you have done to psychiatry." And it went on from there. Her argument was not new to me, certainly has its merits, and I am generally happy to engage in constructive debate. But this was not debate, it was simply a very angry person yelling at a colleague with dozens of other psychiatrists looking on in jaw-dropped amazement. I decided not to prolong this awkward encounter (to the relief, I'm sure, of the leaders of American Psychiatric Press who were nearby), and slunk out of the booth, passing along the way a psychiatrist who smiled at me and whispered, "I subscribe to your newsletter and love it!" In the same issue of the Boston Review as Marcia Angell's great article (profiled in my last post) you can read a fantastic article about commercially-funded CME called "Selling Diseases," written by the irrepressible Adriane Fugh-Berman of Georgetown Medical School. For those who understand the inherently corrupt process of industry-funded CME, the article covers familiar ground, but is nonetheless great reading. For those who are not aware of how self-deluding many of our top physicians have become, the article is an eye-opener and a call to action. "Industry-paid speakers frequently deny espousing marketing messages. I’ve heard many physicians justify their pharma-funded speaking gigs by saying, “I never emphasize their product” or, triumphantly, “I don’t even mention their drug!” But these comments only highlight their sales skills. Pharma doesn’t hire doctors to sell drugs; that’s a drug rep’s job. Pharma hires physicians to sell diseases." I have always been amazed at my colleagues' capacity for rationalizing behavior when it suits their pocketbooks, and Dr. Fugh-Berman nails the issue here perfectly. By the way, Dr. Fugh-Berman's non-profit organization, PharmedOut, has organized a CME conference called "Prescription for Conflict: Should Industry Fund Continuing Medical Education? It wil be held on June 25 of this year in Washington DC, and includes a start-studded line-up of speakers, including Deputy FDA Commissioner Joshua Sharfstein, the author and bioethicist Carl Elliott, senior investigator for Senator Grassley Paul Thacker, the director of Pfizer's CME programs Maureen Doyle-Scharff, among others. (There are also a few almost famous wannabees on the program, like me!) Here is a link to the agenda and the speakers, along with registration information. I hope to see you there! Marcia Angell has done it again, this time in the pages of the Boston Review, where she has just published this article entitled "Big Pharma, Bad Medicine: How corporate dollars corrupt research and education." It may seem that there is little more to learn about how enmeshed academia has become with industry, but, as she did in her classic book, The Truth About the Drug Companies, Dr. Angell has breathed new life into the issue and should inspire us to keep fighting the good fight. And to those academic researchers who think the current path is just fine, I have this to say: no, it is not necessary to accept personal payments from drug companies to collaborate on research. There was plenty of innovative research before 1980—at least as much as there is now—when academic researchers began to expect rewards from industry. And no, you are not entitled to anything you want just because you’re very smart. Conflicts of interest in academic medicine have serious consequences, and it is time to stop making excuses for them."